Forums Home > Have Your Say !!!! > Starting 12 Jan for 4 weekends - enjoy???? Topic : Starting 12 Jan for 4 weekends - enjoy???? These are the roadworks which were delayed before Christmas and will deliver water to the Saxon Dene estate via Hainsworth Road. They obviously don't want Beck water to drink! 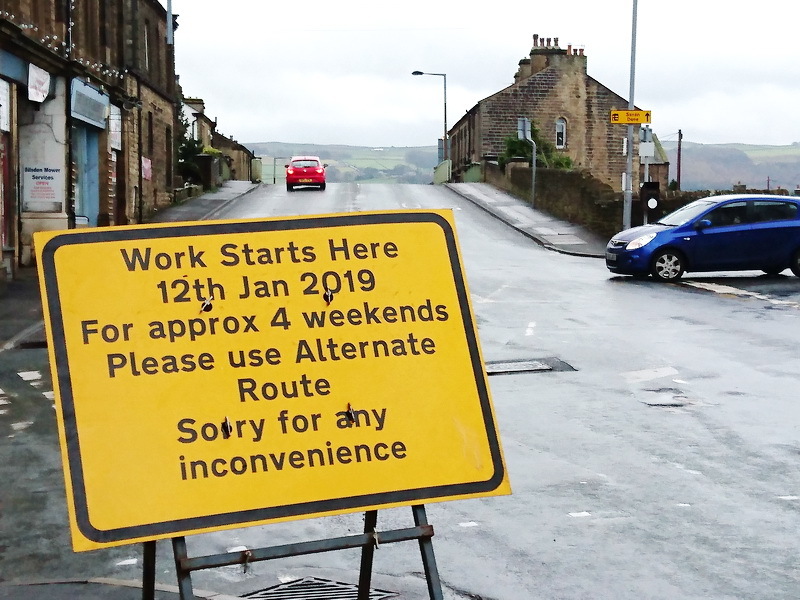 It could be worse, they were going to dig up Keighley Road - residents of Hainsworth Road should have our sympathy for the disruption which will not be just at weekends. What will be the alternate route? Suggestions on the back of a postage stamp?? The pipes have already been laid under Hainsworth Road. After some residents raised concern about access, an official visited, listened and reviewed plans. This resulted in temporary removal of the barriers under canal so that pedestrian access was maintained. The road was closed only when essential and notification was given well in advance. Full marks to Yorkshire Water and Morrison Utilities and everyone who ensured that disruption was minimal. This morning at 9am, 5 vans and lots of men sat in vans, all gone by mid-day total work done was a cover over pedestrian crossing. No work again today. It will be chaos in the morning as the children try to cross the road with the lights covered up. Who is the works manager in charge of this job ?? Rang them and they say it is not there problem. Have tried to ring Brad Met but no answer, then tried morrisons utility only open Mon- Fri, last resort Police on 101 and there response ( it will be the parents responsibility to see then across the road ). I give up..
wheelaman123 your phone calls must have had an effect... all back to normal this morning! Maybe i should stand for the S.T.C., it would seem i can get things done. ! 10.30 am this morning and not a van or worker in sight. The sign says weekend, Sat/Sun. @YWHelp Supposed to be YW road works in Silsden today but did not happen.Covers are on the lights at the crossing so can you remove them before kids go to school in the morning please. Dont go out of your way I know its not your job.If its not sorted by 9am I will ring Bradford Council and The Keighley News. Thank you I did notice.People make plans for roadworks in this location because of severe delays.Please can you say if and when these roadworks will actually happen. Have the double yellow lines from the old post office been put down for the up coming work or will they be permanent. It was so much better driving thru town today. DON'T FORGET THE SUBJECT IS >>>>>>>> Forums Home > Have Your Say !!!! > Starting 12 Jan for 4 weekends - enjoy??? ?